Features a very steep R/T curve. EPCOS, represented in Australia by Ramelec Electronics , has added two new series to its range of PTC thermistor chips. Available in case size 0603, they feature space savings of about 50% in comparison with the predecessor series B59701* in case size 0805. The standard version B59601A0*A062 has been developed for temperatures from 75°C to 135°C in ten-degree steps. Maximum variation from rated temperature is ±5°C. Resistance is 4.7kO at the rated temperature. 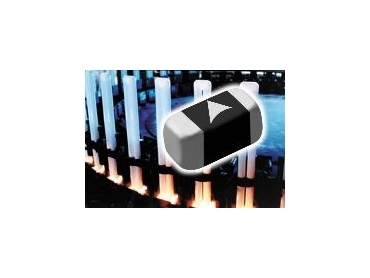 Series B59601A0*B062 is distinguished by a narrower tolerance of ±3°C and is therefore suitable for applications requiring higher measurement precision. Both series are characterised by a very steep R/T curve. If rated temperature is exceeded by 10°C, resistance is at least 20kO in the 75°C and 85°C types. All other types have a resistance of even 40kO for the same temperature change. Miniaturised PTC thermistor chips are suitable for temperature monitoring and protection against excessive temperature in applications with a high packing density. These include dc/dc converters, switch-mode power supplies, electronic transformers for tungsten-halogen and fluorescent lamps, lamp ballasts, rechargeable battery packs and automotive electronics applications. Samples of both series are available.